Today, enterprises need to protect and recover data quickly in the event of disasters, operator errors or technology failures. StoneFly ReflectionTM synchronous mirroring solution is designed for IT professionals managing environments where business operations would suffer a severe financial blow if critical data were lost or offline for even a moderate period of time. Mirroring prevents critical volumes from being a single point of failure and is a powerful tool for a wide variety of data protection and disaster recovery implementations. StoneFly Refl ection provides continuous access to a volume without interruption to data availability by substituting an exact mirror image, simplifying disaster recovery and reducing system downtime. StoneFly Refl ection synchronous mirroring provides high speed Storage Concentrator-based mirroring to a local or campus site. This effectively moves ‘intelligence to the network core’ by consolidating disk management and mirroring functions at the Concentrator. This offloads these functions from servers and localizes mirroring traffic on the IP SAN. StoneFly Refl ection synchronous mirroring simplifi es deployment, operating transparently to users, applications, databases, and host processors. The result is “Next Generation” performance, reliability and high data availability for critical applications. Servers Each mirror image contains an identical copy of the data, and can be substituted for one another in case of data loss or errors. Mirror images can be either local mirrors or they can be campus mirrors. Synchronous mirrors are used for a variety of applications, both locally and on campus sites. Common uses include backup/restore, business continuance, archiving, data migration, disaster recovery, content distribution, and business intelligence. Backup/Restore: Data is copied on a periodic basis, sometimes to a campus location, and can be restored in case of data loss. A detached mirror volume can be mounted as a separate volume. Once the mirror is backed up, it can be rebuilt or deleted as required. Backups can also be sent to WORM media or tape as a background activity. Business Continuity: Mirrored images are identical to each other, and are interchangeable, and entirely transparent to applications. For example if primary volume is broken, the application will continue to run from a different mirrored volume in the mirror set. Archive/Retrieve: For long-term data storage, mirror images can be permanently detached and written onto optical WORM or WORM tape. Data Migration: Duplicate mirror images are created with the original source data for use at a new server or campus location, often in conjunction with corporate moves, system upgrades, or to meet business continuity objectives. Disaster Recovery: Mirrored images are always an exact duplicate of each other and can be substituted at any time in case of disaster or failure of a mirror image. 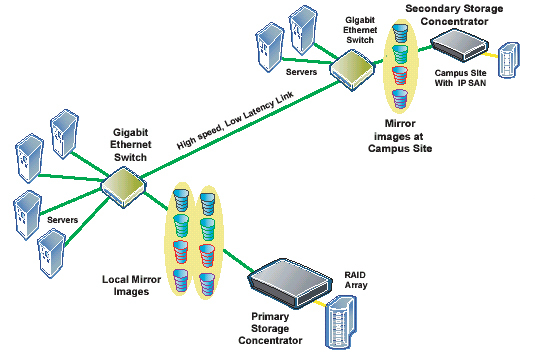 Content Distribution: Mirror images are created for a different server location to improve access response times for online databases or websites. Or for educational applications, each student can access a detached mirror image of an application to perform individual work. Business Intelligence: A static database is required for business intelligence or data mining operations. Refl ection can detach a mirrored image so the user can perform the business intelligence function. The Mirror image can then be reattached or deleted as required.